Anti-Semitic sentiments and incidents continue to rise worldwide, particularly in the West. Sometimes this form of bigotry is perpetuated by far-right elements, other times at the hands of far-leftists and Islamists. It is rare to see both extremes unite for any cause except for their mutual disdain for Israel or Jews. It is even rarer to see them applaud and defend an American politician. But that is exactly what's happening as Rep. Ilhan Omar's anti-Jewish tropes receive widespread praise from both U.S.-based Islamists and white supremacists. Criticism and condemnation rained down on Omar, a Minnesota Democrat, Monday after she tweeted, "It's all about the Benjamins baby" to explain why she and fellow Democrat Rashida Tlaib draw attention for their "criticisms of Israel." Who is the source of this popular reference to cash? "AIPAC!" Omar added, referring to the American Israel Public Affairs Committee. Facing serious backlash from many in her party, Omar issued a caveated apology. "My intention is never to offend my constituents of Jewish Americans as a whole...This is why I unequivocally apologize," she wrote before qualifying that she has an issue with "lobbyists in our politics" such as AIPAC. Omar's views are hypocritical given that she received almost $60,000 from political action committees and lobbyists, including $5,000 from CAIR-California in 2018. On Wednesday, CNN's Manu Raju reported that Omar was curt and sarcastic in response to his questions on her initial comments. Omar answered, "Are you serious?" to one of Raju's questions and then she said: "Yes I tweeted, and there's a response. You can run that. Have a nice day." Omar seems unaware of how offensive her initial comments are, or she comes off as insincere in her apology. She has remained silent while people have tried to raise money for her 2020 re-election campaign as an act of defiance against the criticism she is receiving. And, further undermining the sincerity of her apology, she has said nothing to correct those who insist she did nothing wrong. Many people have tried to defend Omar. Journalist Glenn Greenwald, who sees Israel as "an apartheid, rogue, terrorist state," started the controversy by saying Omar and fellow freshman U.S. Rep. Rashida Tlaib were being singled out for criticism because "U.S. political leaders ... – [were] defending a foreign nation even if it means attacking free speech rights of Americans." Omar's "all about the Benjamins" response implied Jewish money was the driving factor. Greenwald condemned House Democratic leaders as "craven, cowardly" and said their reaction proved his point: "So a young, exciting, dynamic immigrant - the first black Muslim woman ever elected to Congress - is denounced by her own Party's leadership less than a month after she arrives in DC, due to her criticisms of AIPAC & Israel," he wrote. "Does this say anything about the power dynamic in DC?" But the strongest defense for Omar comes from U.S.-based Islamist groups and leaders. The Council on American-Islamic Relations (CAIR), for example, issued a statement Monday acknowledging that anti-Semitism is real, but Omar hasn't engaged in it. Supporters of Israel, according to CAIR, are the real problem. "CAIR applauds Reps. Ilhan Omar and Rashida Tlaib for their courage in speaking the truth about Israel's racial, religious and ethnic segregation. Agenda-driven groups -- like AIPAC -- have for decades enabled that segregation and the resulting denial of human rights for Christian and Muslim Palestinians." CAIR Executive Director Nihad Awad thanked Omar and Tlaib for their "courageous and principled stance" against the "Israeli Lobby." Awad has deep connections to a U.S.-based Hamas support network that operated during the 1990s. The "Palestine Committee" umbrella including the Islamic Association for Palestine, where Awad worked before creating CAIR. And he was included in Palestine Committee rosters and meetings. When CAIR was formed in 1994, the same year Awad publicly endorsed Hamas, it was immediately added to the Palestine Committee. CAIR's leadership appears to forget that they run an "agenda-driven group," devoted to whitewashing Hamas and other terrorist activity against Israel while CAIR leaders praise Islamist regimes, like Recep Tayyip's Erdogan's Turkey, which earned the distinction of being the world's top jailer of journalists. 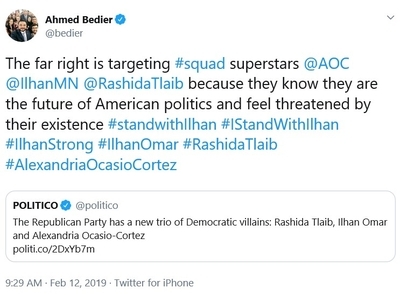 On Tuesday, activist Ahmed Bedier, former executive director of CAIR's Tampa chapter, tweeted that the "far right is targeting" Ilhan Omar in response to a Politico story. Linda Sarsour, co-chair of the national Women's March, also chimed in on Tuesday, tweeting that the "end goal of the right is to marginalize prominent voices who dare speak up for Palestinians," adding "We need to resist this." Sarsour has her own long record of anti-Semitism, including blasting any attempts of interfaith dialogue or civic cooperation that include "Zionists." She promotes a conspiracy theory, the IPT exclusively exposed last September, saying Jews are responsible for American police shooting unarmed black people because of a leadership training program in Israel. She has never apologized for the smear. Does the "right" or "far right" include Nancy Pelosi and the House Democratic Leadership? Because Democratic leaders unequivocally rejected Omar's comments as anti-Semitic in a statement on Monday. "We are and will always be strong supporters of Israel in Congress because we understand that our support is based on shared values and strategic interests," their statement said. "Legitimate criticism of Israel's policies is protected by the values of free speech and democratic debate that the United States and Israel share. But Congresswoman Omar's use of anti-Semitic tropes and prejudicial accusations about Israel's supporters is deeply offensive." To Sarsour and others, however, Omar did nothing wrong. In fact, she is the victim. "I will not be silent in the face of attacks, harassment and targeted policing of speech from a Black Muslim woman elected official, our sister Ilhan Omar in the name of combatting antisemitism," Sarsour wrote on Facebook. We can stand up for Ilhan knowing her record and what she stands for and also combat antisemitism." But Omar's record includes a 2012 complaint that Israel "hypnotized the world" and she prayed that "Allah [would] awaken the people and help them see the evil doings of Israel." Prominent American Islamists Esam Omeish and Hassan Shibly shared Linda Sarsour's Facebook post on Monday blasting AIPAC. 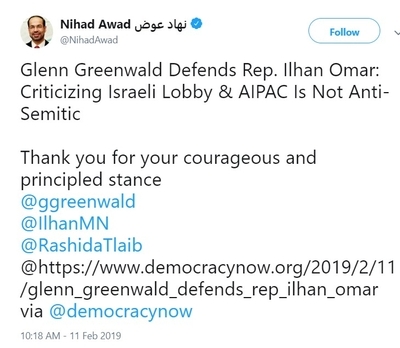 Omeish, who praised Palestinians in a 2000 speech for deciding that the "Jihad way is the way to liberate your land," and has lauded Egypt's Muslim Brotherhood, tells his followers to "STAND WITH ILHAN." Shibly runs CAIR's office in Tampa. As a college student, he said that Iran's Lebanese proxy Hizballah is "absolutely not a terrorist organization, and any war against them is illegitimate." He has repeatedly accused the FBI of entrapping innocent Muslims and even of cold-blooded murder. The latest addition to Omar's public defense comes from Al-Awda, the Palestine Right to Return Coalition, which "expresses our solidarity with solidarity with Reps. Ilhan Omar (D-MN) and Rashida Tlaib (D-MI), targeted for racist anti-Arab, anti-Muslim and fundamentally anti-Palestinian attacks." Al-Awda called the immediate backlash to Omar's comments "an attempt to silence, marginalize and suppress criticism of Israel and support for the Palestinian people's fundamental rights to self-determination, national liberation and return." This coalition, like other Islamist groups, unabashedly supports efforts to eliminate the Jewish state of Israel by advocating for Palestinian refugees and their descendants to "return" to Israel and erode the country's Jewish majority. Similarly, Samidoun, a Palestinian prisoner's advocacy group, hailed Omar for her BDS support and "urges a broad mobilization to defend her against media and political incitement by Israel and its allies." "Rep. Omar said nothing wrong" in her statements that she sort of apologized for and which Democratic Party leaders admit was blatantly anti-Semitic. In 2017, Samidoun organized a seminar celebrating the Popular Front for the Liberation of Palestine (PFLP)'s 50th anniversary. The PFLP is responsible for numerous terrorist attacks targeting Israeli civilians. Among them, the 1969 bombing of a Jerusalem grocery store that killed two college students. Samidoun championed the cause of bombing plotter Rasmieh Odeh when she was prosecuted for naturalization fraud. But U.S. Islamists are not the only ones defending Omar. Former Ku Klux Klan leader David Duke also backed Omar's assessment when responding to former U.S. ambassador to the United Nations Nikki Haley's rebuke of Omar. "So, let us get this straight. It is 'Anti-Semitism' to point out that the most powerful political moneybags in American politics are Zionists who put another nation's interest (israel's) over that of America ????? ?," Duke tweeted on Monday. Helping their Islamist allies, far-left organization Jewish Voice for Peace (JVP) launched a website and campaign called "#IStandWithIlhan." JVP pushes the "Boycott, Divest and Sanction" (BDS) campaign that seeks to isolate Israel politically and economically. It is seen as anti-Semitic since activists have not launched similar campaigns to target countries with worse human rights records, or those which occupy land like Turkey, Russia, China and others. During her primary campaign, Omar claimed she didn't support the BDS movement because it would not help bring about a peaceful, two-state solution to the Israeli-Palestinian conflict. She quickly reversed herself after winning election to Congress. But JVP still takes her at her word: "Omar continues to be attacked by a bad-faith smear campaign" despite her apology "for the impact of her statements." Even Omar's defenders qualify her initial responses as a "I'm sorry that you were offended" type apology. Last year, concerned leaders from Minneapolis' Jewish community hosted a type of "anti-Semitic intervention of Omar" as a result of her previous comments. But Omar's anti-Semitic statements linking support for Israel to Jewish money, along with her somewhat disdainful reaction to questions, clearly show that Omar failed to learn how to express herself without invoking anti-Semitic tropes. She can prove us wrong by repudiating those who "#StandWithIlhan."